Ghosts of memory circle my head like nagging black flies. We all go shopping together for a mirror to put above the piano. Attitudes have changed. Authentic social life has been replaced with its representation. A half-grown man in a baseball cap that says Vietnam Vet on the front visits me in my sleep, apparently just to ask, “Which is correct, ‘each is’ or ‘each are’?” I don’t even attempt an answer. Trees in the background are emitting spiky beams of yellow light. The same applies to the fleeing birds. Meanwhile, someone one is never really sure was there is climbing out the window. Lincoln always appears in my dreams quoting “The Big Lebowski.” He claims that he has seen the film 873 times. She takes a 25-caliber Berretta, a lady’s gun, and not a really nice lady at that, and shoots him in the head. All she can say after is, “Now what do we do?” His brains are leaking from the bullet hole as he drives down a tree-lined country road. He’s alone in the car. The sun shines erratically through the leaves. Horses with shiny black coats graze behind a rail fence. His thoughts keep breaking apart. The car drifts off the road and rolls to a stop. He slumps over, dead. Everyone spills out onto their balconies to get a better view. My wife says I was shouting again in my sleep. 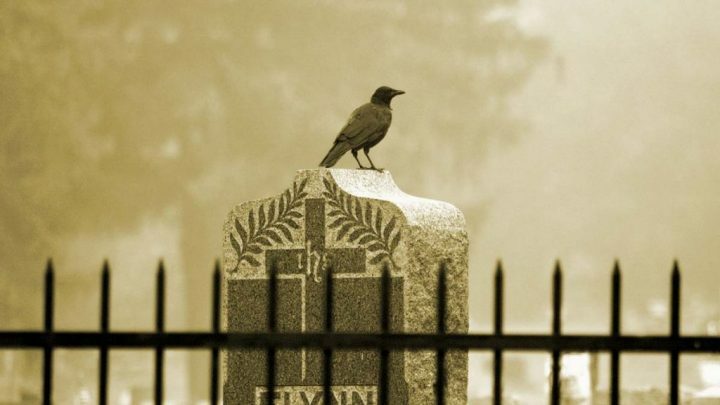 The crows sat quietly on the headstone as the women of the village beat someone to death with hoes all night long. When the wind blew, my porridge was full of sand. You should wake up in the morning glad you can’t remember your dreams. I started to write on the board Eichmann in Jerusalem, the title of Hannah Arendt’s book about the banality of evil, but some professorial instinct made me turn around and ask, “You know who Adolf Eichmann was, right?” In the buzzing silence I thought I could hear a beast with seven heads and ten horns scratching itself like a dog out in the hallway. I looked at a girl who usually knows the answer. She was looking down at her phone. It was my last class of the week, a sad little funeral in the rain. A better teacher might have had a different reaction. I just asked if they knew who Hitler was. The scene was a synagogue, but had nothing to do with religion. It was simply physics. Eyeglasses went into one pile and gold-filled teeth into another. There was no place for stories. Out in the street, rain tap danced the Grapevine. The same drunken weather occurred simultaneously everywhere. Dumb shits on smart phones claimed that sunshine was overrated, when, in fact, the Golden Oriole, Yellow Hammer, and Goldfinch all have yellow-and-black wings that can look gold and gray in the setting sun.